So one of the coolest things we have in Mill Valley, CA (as well as in neighboring towns) is a Veggie Swap. Every summer Sat. morning at the local park (which I can walk to), neighbors bring extra vegetables, fruits, seeds, seedlings and baked goods to swap! It’s so great. It’s put together by Marin Open Gardens http://opengardenproject.blogspot.com/ and they also coordinate gleening for when your fruit tree is laden with ripe fruit, people sign up to come help with the harvest. 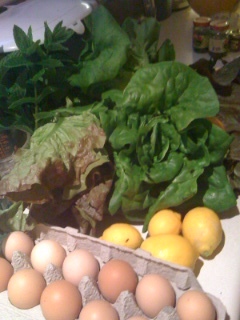 The locally grown organic produce arrives in a box (which gets returned for the next shipment). We have friends who live in Stinson Beach and their daughter just dropped off an amazing bag of produce they grew and a dozen fresh eggs!!! Look at those Meyer lemons!!! Thanks Barb!! Food for thought ~ You are meant to live an expansive, exhilarating, good-feeling experience. It was your plan when you made the decision to become focused in your physical body in this time-space reality. You were born knowing that you are a powerful Being; that you are good; that you are the creator of your experience, and that the Law of Attraction (the essence of that which is like unto itself, is drawn) is the basis of the Universe, and you knew it would serve you well. And so it has.